Celebrating Art & Lit. in the Rock'n'Goal Capital of the World! The Reebok story started in 1895 in Bolton, Greater Manchester, when Joseph William Foster, wanted a pair of spiked running shoes. He created the first 'Foster' running shoe and the sportswear company went onto become one of the biggest in the world. Today the company's global headquarters are in Boston, Massachusetts, USA, but the UK head office remains in Lancashire. They have never forgotten their roots; they built The Reebok Stadium in Horwich for Bolton Wanderers FC in . UMBRO International was established as a small family business in 1924 in Wilmslow, Cheshire. Over the years, Umbro has become synonymous with football, providing kits for the world's best teams including Manchester United. Their Headquarters remain in Manchester. Based in Altrincham, Cheshire, Cotton Traders were formed in 1987 by ex-England Rugby Union captains, Fran Cotton & Steve Smith. Now, 13 years further down the line Cotton Traders is a thriving business with a turnover of nearly £30 million. they specialise in rugby and sportswear. Manchester's Henri Lloyd is a name synonymous with quality and high performance foul weather clothing for the sailing and yachting community. The leisurewear company is famous for high quality sportswear, fashion and outdoor clothing. You are as likely to see Henri Lloyd clothing on the streets of Manchester as you are in International yachting competitions. At 15 years old, Joe Bloggs founder, Shami Ahmed, used to catch the bus straight from school in Burnley to Manchester so that he could work for his father's wholesale fashion business. Joe Bloggs established itself as the name to be seen wearing by teenagers during the Madchester years, and it has spawned a fashion empire encompassing everything from jeans and toiletries to watches. Wayne Hemingway - "Just Above the Mantlepiece - Mass Market Masterpieces"
Local fashion designer and former Red Or Dead boss, Wayne Hemingway's new book, is crammed with over 300 gems from his own collection. A superb celebration of the mass market art that seeped into homes from the 1950s onwards. Take a bunch of former skateboaders, snowboarders and BMXers from Manchester who are sick of having nothing to wear so decide to set up their own clothing company. Add a dollop of Manc cool and sense of humour and you've got Steely Flats. So if you're looking for something a bit different and don't want to look like another US skate-punk clone, check out Steely Flats - perfect for hanging out, eating chips in Rainy Manchester. Manchester music legend, ex-Smiths and Electronic guitarist, Johnny Marr, now has his own clothes label. 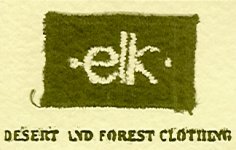 Elk clothes are 'built in Manchester' and have been described by M People's Mike Pickering as "beautiful scallywear".